Most of the people have the high cravings for oily and deep fried foodstuffs but treating yourself with these greasy meals frequently may lead to severe health issues. 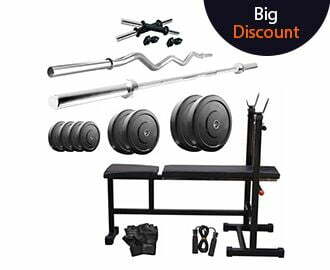 It doesn’t mean that you should skip out with these temptations, as in this technological era, the smart alternatives are available to us. Have you guessed what I am talking about? 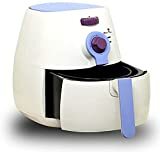 Yes, of course, I am talking about the most healthy alternative, “The Air Fryers,” that you all must have in your kitchen in the era of healthy living. 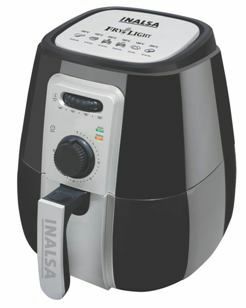 If you think that air fryers will not imitate exactly like the taste and texture of typically fried food items, here you are absolutely wrong. The air fryers offer the same taste and texture with crispy and golden outside and moist inside, by using a few drops of oil only. It means air fryers fry your favorite food items like french fries, potato chips, samosas, nuggets, etc. without drenching them in oil. This is all the new way to get your classic fried foods without having extra grease and fat, but still, quench you with the same satisfaction. For the detailed review of each of these air fryers, please head to our Review Section..
An air fryer comes together with different cooking methods in one simple appliance that you can easily use to get your favorite fried foods with a little bit oil used. The appliance actually works on the convection mechanism, and so it is also known as mini-ovens. It has an electric coil that provides radiant heating to the food and a fan positioned above the coil circulates electric heat around the food that is referred to as the convection heating. When you apply a thin layer of oil in the tray where you have placed your food to get fried, the convection mechanism converts it into the mist that coats the food while circulating. And the hot air flow makes your food dry and crispy from outside as well as moist, soft and fluffy from inside. You can easily understand the working principle of an air fryer by the following video. 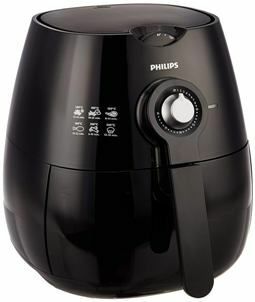 Cooking Capacity- This is one of the most important factors before purchasing an air fryer. As the air fryers come in different sizes with the ranging capacity from 1-4 liters and above, you can choose accordingly. In my consideration, the air fryers with the capacity of more than 4 liters is an ideal choice for a medium sized family. 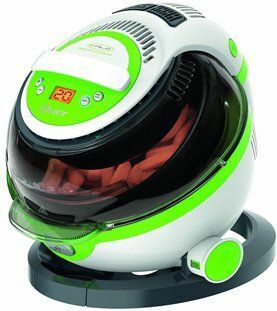 Power and Wattage- The next comes the power and wattage of an air fryer. Typically they come in the range of 800-2100 Watts of power. More wattage means the more quick cooking. So go for the one having high wattage power. But make sure that your kitchen power outlets must support that wattage power. Size- Size is another important thing for consideration. Make sure to buy the one that is compact and easily fits your kitchen countertop without taking much space. Temperature Control- Opt for the model having a temperature control feature. This feature lets you cook a variety of foods with a specific temperature setting. It is also important to go for the model that reaches high temperature for proper cooking of foods like tandoori chicken, chicken nuggets, etc. Auto Functionality- Auto functionality refers to the automatic shut off feature in the air fryers. This one is an important feature in an air fryer that makes the appliance shut off automatically once the cooking gets completed and horns an alarm to notify you. Food Separator- The best models of air fryers come with the food separators including diverse racks, trays, etc. to let you cook multiple foods at the same time. So, go for the one having this feature that also saves your time in cooking. I am sure that you will now have a clear idea about the plus points and features of air fryers that serve a multitude of tasks in the kitchen. From making the zero oil versions of fried foods to baking and to steam vegetables, it can do everything without any mess. But with the plenty of options for the air fryers available in the market, it is quite confusing which one to buy. So, for making your buying decision easier, we have reviewed here our best picks of air fryers that you can buy for all your oil-free frying needs. Have a look to pick the best one. Get perfect texture and delicious results with this model of Philips Viva Collection equipped with rapid air technology. 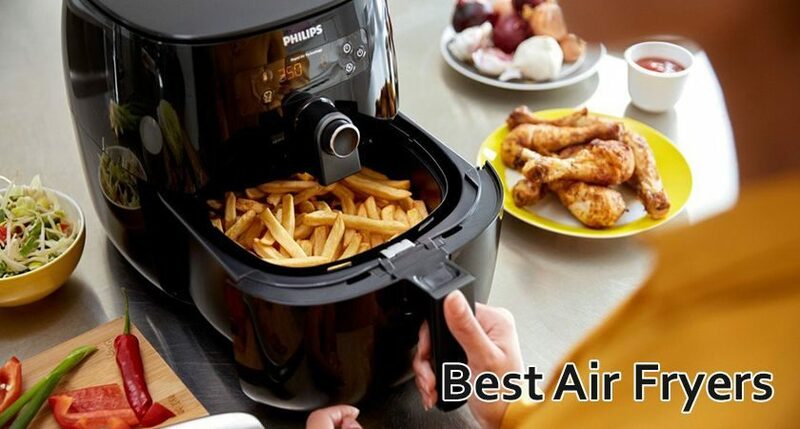 It lets you cook your favorite fries with air with a little bit or even no oil. The best part is that this innovative appliance not only makes you to fry but also helps you to roast, grill, and bake your favorite food items in no time. This smart air fryer also comes with the adjustable time and temperature control feature that you can adjust accordingly depending on the food you are going to prepare. Its 1400 high wattage power lets you cook very quick and fast. 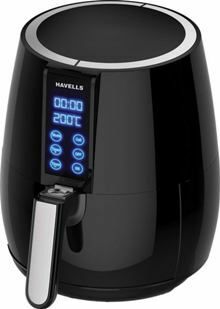 This air fryer from Havells is absolutely the smart choice for every health-conscious foodie in their kitchen. It comes with a rapid air technology letting you fry, grill, roast, and reheat the food with less or no oil and the best part is that the taste is perfect. The perfect part is its capacity that is 4L which is enough to serve the medium-sized family very well. Also, its air frying basket comes with a separator that lets you cook multiple items at the same time and thus saves a lot of your time also. 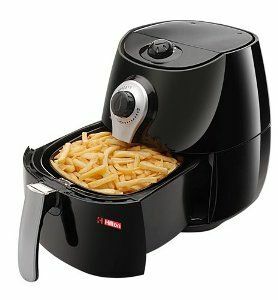 For all those who are health-conscious and love the fried snacks, this air fryer from Kenstar is another best choice. It gives a healthy twist to the fried foods by using only a little bit of oil. And thus not only satisfies your taste buds but also makes the food healthy too. 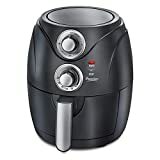 You can use this air fryer for frying, roasting, grilling, and baking your favorite food items. This air fryer comes with a removable food tray of capacity 3 L that is pretty enough to fry a large amount of foods in one go. It also comes with two LED indicators, one showing that the power is on, and the other one showing that cooking is in progress. Get a healthier twist of fried foods with this air fryer from Oster. The Oster Halo is one of the great alternatives towards the deep-fried foods and makes the food even more tasty and healthy. With this halo air fryer, not only you can fry the food items in less oil, but also bake, roast, grill, and reheat your favorite food items. It comes with the halogen heating technology and automatic thermostat feature to maintain an even temperature. Also, its unique tilt function and the rotating bowl fry your food very evenly with the crunchy outside and moist inside. 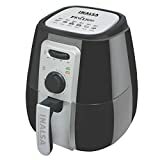 With the most sophisticated, classy, and stylish design, this Air Fryer from Inalsa is a great addition to your kitchen for all no-oil cooking. This model comes with a basket and a divider so you can cook two foods at the same time with ease. Two indicator lights are also there, one showing that the power is on, and the other one turns on when the preheat temperature is reached. The model also comes with the cool touch handle ensuring the safe and comfortable handling. 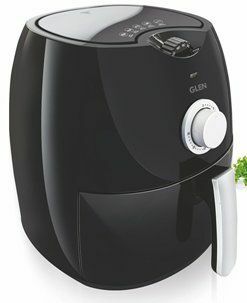 Now go healthy and oil free with this air fryer from Glen. Not only you can fry with this air fryer, but also, roast, grill, toast and reheat the food with various temperature settings accordingly. With the optimal airflow feature, this air fryer cooks your food evenly. And thanks to its decent capacity that lets you cook a good amount of food in one go. For your mouth-watering and delicious snacks delights cooked in little oil, this one air fryer from Prestige is the best choice. 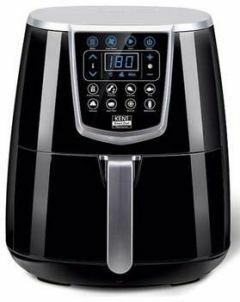 So, enjoy your favorite food items in a healthy way using this air fryer. It comes with the capacity of 2.2 l that is pretty enough to serve the small to medium-sized family. The high 1400 W power of it makes your food in a very quick and easy way. This smart device from the brand Kent is yet another smart choice to relish upon your favorite snacks without the excess oil. This air fryer provides you the option to fry, bake, grill, roast, and steam all with the same device. Just select the desired function, and this device can do all with ease. It is equipped with rapid hot air technology ensuring proper air circulation and maintaining the right temperature level to prepare food with perfection. This Kent air fryer also comes with eight preset menus for the most easy operation to makes your favorite dishes without any hassle. And the best part is that you can get your favorite mouthwatering snacks with less oil that are crispy outside and tender inside. Moreover, its cooking basket has a large capacity to prepare more food in short interval. And the next is Hilton air fryer to fry, grill, and bake your favorite food with little or no oil. Its smart rapid air technology offers a smart way of healthy oil-less cooking even without compromising the taste. With the adjustable temperature control, you can easily set the desired temperature for what you are cooking accordingly. Even more, its unique design allows the food to get prepared in no time. Plus, the smart auto shut off feature, auto smart lock, and special child lock ensures the extra safety while using it. With such an amazing price range, this is another great option to prepare your favorite snacks without using oil. This air fryer from La Italia by Renesola comes with a specially designed high-speed fan that results in faster cooking. Means its rapid air circulate system fry food faster and save energy. The device also comes with variable temperature control for different cooking modes that let you make your favorite dishes more conveniently. Its smart control panel with specially designed control knobs allow you to operate the device more conveniently. This air fryer also comes with the cool touch and shockproof body for easy handling, plus the convenient handle makes it more handy to use the device.